Ok, we at Coinspeaker are pretty aware that this is not how the song goes but nevertheless it’s true. The popular cryptocurrency exchange Coinbase launched a new 12-day event similar to the popular Christmas carol of ‘The 12 Days of Christmas’. The Christmas carol has been long known to be a song that talks about giving gifts to loved ones in a 12 day period. In the classic song, the value and importance of each gift increases as the days go by with the first day being Christmas day. 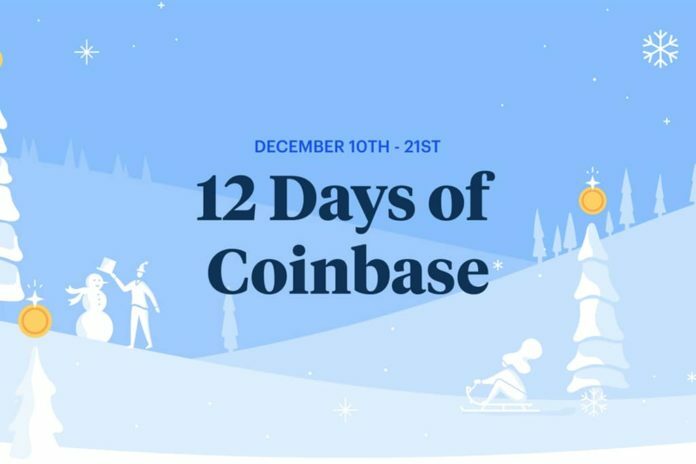 Unlike the popular song, the team at Coinbase chose to start their 12 days of giving on the 10th of December. The 12-day event ends on the 21st of December which is four days before Christmas. So, in order to create tomorrow’s open financial system, Coinbase decided that it should be good not just to allow people to buy crypto, but also to use it. Day 1 saw Coinbase announcing that users could buy gift cards so that family and friends could get some Uber, Adidas and Nike surprises through its U-gift program. GiveCrypto.org (founded by CEO Brian Armstrong) takes some of the best parts of that system: cross-border accessibility, ease of small payments, and real-time transfers, all in order to empower those who don’t have enough in legacy economy. That’s why they decided to use 12 Days of Coinbase as an opportunity. First was making a $10,000 donation in Zcash ($ZEC) to support their pioneering work. The CTO of Coinbase said that he is aware of us having a global economy and as such, a need for a global digital currency. In their new video, for the “third day of Christmas”, Coinbase tried to explain their mission and their vision about how cryptocurrencies can change the global economy and why is that important. Julia Rose West, a Coinbase customer and a futurist explains that this is going to transform how we think about real global economy. Why give crypto rather than cash? Coinbase says that they are aware that many families lack reliable access to bank accounts, and even if they do, the Bolivar (the fiat currency of Venezuela) is highly inflated and volatile. As a result, cash gifts can be of little value to many of those in need. However, crypto and GiveCrypto.org’s network of vendors provides a direct, stable line of support. Decentralization seems to be a problem for some companies nowadays. Last example was Ripple whose CEO Brad Garlinghouse had to hit back hard at naysayers who have criticized the XRP ledger for being centralized. Garlinghouse was abruptly clear on his position by saying that XRP is “fully decentralized.” He went on to accuse some naysayers of fighting “holy wars” and “spreading misinformation” because they have an economic interest in doing so. Just few days ago, Coinbase revealed that they are working on exploring support for the second-largest cryptocurrency. They have confirmed that they are continuing to explore the addition of new assets. This work also includes close cooperation with regulators and banks in order to make these new cryptocurrencies available for Coinbase customers in as many jurisdictions as possible. The company has also published the list of 31 potential new additions which includes among others the above-mentioned XRP, EOS, Cardano (ADA), NEO and Tezos (XTZ). They are also inviting everyone who can or want to join them in this holiday season, in donating to organizations making open financial transactions possible for people everywhere: just press here or here. All I Want for Christmas is ZCash? The second day of donations is dedicated to Venezuelan crisis. Donation will also get to support GiveCrypto.org’s project in the Venezuelan border town of Santa Elena de Uairen. With that gift, the organization will put $1 USD worth of crypto directly into the crypto wallets of more than 100 families in Santa Elena every day for 3 months. With that, recipients will be able to purchase food and basic supplies at a local store that accepts payments in crypto, subsidizing everyday expenses. Just for example, the $1 USD equivalent per day can buy 1–2 kilos of protein or 2-kilos of starches and vegetables. Recipients will come from the networks of Venezuelan families already in GiveCrypto.org’s program with Bonnum. Zcash is the latest token to be added to Coinbase Pro, the company’s trading platform for professional investors. Coinbase has stated that it is now looking into adding several new tokens to its list of offerings after several customers’ ongoing wishes for more assets. The exchange has recently announced that its new strategy is driven by customers. They have noted that the one thing their customers want is new cryptocurrencies on the platform. This in turn leaves the door wide open for the exchange to list popular cryptocurrencies such as XRP, Stellar (XLM) and Cardano (ADA) as part of their 12 day event. “The ‘Venezuela meme’ has been overused by ‘crypto’ scammers for years now, but I’m shocked to see Brian do the same.